There are new data sources, data science is revolutionizing the investment process, the global political landscape is as volatile as cryptocurrency prices and one of the most popular “television shows” is a person playing Minecraft. Meanwhile, the market is roaring, innovation continues at a breakneck pace and traders have the same question - what is my role and what’s the most ergonomically correct height for my standing desk? At this year’s Liquidnet Institutional Trading Summit, held at the Montage Palmetto Bluff resort at South Carolina, the main theme was enhancing the skills of the buy-side trader. “Our job is to find and mine the data that helps drive toward alpha generation,” Liquidnet CEO Seth Merrin told an audience of 75 U.S. and global traders from leading investment firms. This year’s Summit had consistent themes throughout every panel. As trading processes become more and more automated thanks to Big Data and algorithms, traders must deliver differentiated value to their clients. The role of the trader is constantly evolving and trading desks must become more embedded into the investment process. More automation is coming to the trading process that will free up the buy-side trader from the administrative and routine tasks that today take up too much of his or her time. And, that freedom will allow for more focus on the illiquid, hard-to-trade executions. Alpha generation can come from a better pre-, intra-, and post-trading process; it’s not just about stock selection. “Real job security is ensuring asset managers achieve alpha,” said Merrin. Traders may be drowning in data but they are poised to amplify the volume of information beyond market data and other traditional sources such as news or fundamentals. Culled from social media feeds, cell phones, the Internet and other sources, traders and portfolio managers can use Alt Data to see how well a company is performing by metrics beyond company filings. Is the CEO’s family upgrading to a new ski house this winter or downsizing as they discover simple, non-materialistic values? The answers can be found on the social media streams of family members of the company’s C-Suite. Are there fewer job listings on a company’s website or are they taking too long to fill key roles? Are factories in China burning the midnight oil or operating only in standard, nine-to-five shifts? This kind of information can be accessed more readily today than ever before. During Merrin’s presentation, he cited the seminal work done by Burch Lev and Feng Gu in The End of Accounting and the Path Forward for Investors and Managers (2016). Through their research, Lev and Gu show how the ubiquitous financial reports have become useless in capital market decision-making. In the 1950s and ‘60s, traders and asset managers could look at a company’s balance sheet and glean approximately 80% of what they needed to know regarding the firm’s stock price. “Today the balance sheet might be 50% because there are so many factors impacting the stock price,” said Merrin. 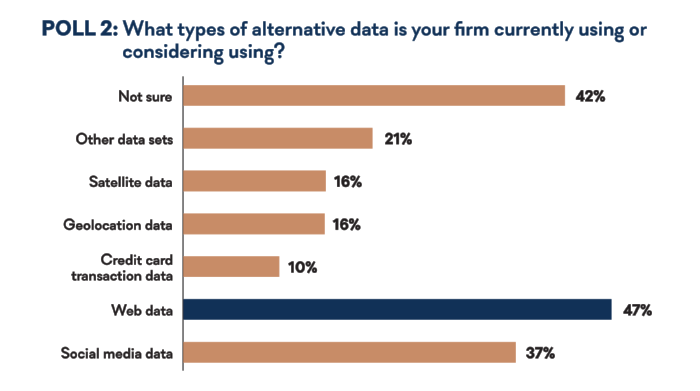 When it comes to incorporating Alt Data inside trading firms, 1 out of 5 Summit attendees reported that they are using it in “a big way,” while nearly half said they are testing the waters. Internet data is the leading source of Alt Data (47%) with social media weighing in at 37% and geolocation data at 16%. If your firm would like to better understand the expanding role of alternative data and how your trading/investment team can effectively leverage it, please contact your Liquidnet account manager to arrange a meeting with a member from our Liquidnet Discovery team. Regulations remain a key concern. Michael Piwowar, former SEC Commissioner and Chief Economist for the U.S. Senate Committee on Banking, Housing, and Urban Affairs, said that despite the successes of the Democrats in the House of Representatives, the Senate remains unchanged. Any new laws impacting the financial sector would have to originate from the Senate within the next 12 months before “silly season” starts with the U.S. elections of 2020, according to Piwowar. Despite President Trump’s prolific and often volatile tweeting, Piwowar doesn’t see any Black Swans from the Commander-in-Chief, adding that the president has kept his Twitter remarks about finance and individual firms to a minimum. He rarely mentions specific investment firms and if he does comment on finances, it is usually reserved to the Fed’s action around interest rates, he said. In terms of MiFID II, this regulation has reinvigorated the European buy-side trader and given them more discretion and liberation in the execution process. Meanwhile, in the US and APAC, there has been less change in behavior. Piwowar says the SEC chairman’s office relies on Alan Cohen, a former Chief Compliance Officer of Goldman Sachs, who is “running point” on this regulatory initiative. “He knows how a company can and cannot change.” He added that a severe correction during this bull market could unleash “bad ideas” that could impact investment firms. “Dodd-Frank contained a lot of bad ideas that were resurrected and repackaged during the financial crisis,” he said. If you are interested in receiving Liquidnet’s global market structure updates, please send your e-mail address to mifid2@liquidnet.com. In the “Future Proofing Best Execution” panel session, one head trader said that best ex is a “cultural change” for his firm. “So long as everyone believes in it, we build on how to make it better,” he said. This means working with compliance officers and trading desks in offices around the globe for the larger firms. “Having traders in the process is paramount. If you remove yourself, you will find something that isn't best execution,” said another panelist. That said, more transparency is not always better. “I had meetings with folks trying to add transparency. It is on the radar screen and more so these days, particularly for retail and not so much for institutional,” said one trader. And with big trades, every trader should understand what they’re trying to do. “We need to understand the story of the trade,” said one trader from a major firm. The markets and trading desks must embrace innovation and disruption, advised Luke Williams, founder and executive director of the NYU Innovation Lab and bestselling author of “Disrupt.” Disruption is not only good, it will lead to innovation and ultimately alpha. “We are operating in a dramatic new world, the silicon has left the valley, and every business is a technology business,” he said. Along with death, taxes, and early morning weekend tweets from the White House, a certainty of a head trader’s life is how to pay for research. The investment community remains one of the few businesses that still struggles with what to charge and how to pay for one of the key ingredients it needs to do its job. While no one seems to have a satisfying answer, buy-side firms are voting with their dollars. Two buy-side panelists said their firms are trimming their research budgets under orders from the executives. “We continue to trim research list,” said one trader. “We sent emails to research providers and we are shrinking and rightsizing to pay it out of pocket.” Another trader said they have unbundled their research for the last three years. “We asked investment teams to work on cuts of 25 percent,” he said. In a Summit poll, audience members were asked how they pay for research. Respondents reported that P&L accounted for 8.5% of the payment method, bundled came in at 38%, CSA at 38% and ring fence scored 15% of responses. And the research debate is still roiling. One head trader admitted that his firm has more pressure to cut costs than it has received in past years. “Philosophically we could have had this conversation ten years ago,“ he said. That said, the sell side tells the buy side a “number” for research. This price varies widely across the bulge bracket. Brokers are getting more creative on how they calculate cost of services and payment channels. For example, prime brokerage, stock loan services, and derivative/structured products can be targeted to pay for research, ECM access, and balance sheet and risk. The buy side can gain leverage with brokers by consolidating all their product commission wallets into one number. On the other hand, FX, Swaps, FI, and equities are often rolling into one person, and that person should represent the entirety of your firm’s commission payment to a broker. “Focus your firepower,” advised one buy-side trader. Have questions about unbundling, RPAs, and CSAs? Please contact a member of your Liquidnet coverage team to arrange a call with one of our commission management experts. One of those disruptions is Algo Wheels. In the panel session entitled “Beyond The Algo - Augmenting Your Trading Strategy and Finding Alternatives to Algo Wheels,” panelists debated the role modern trading formulas play on the trading floor. While some traders admit to using algo wheels, some still rely on the algorithms and liquidity provided by their preferred brokers. As one buy-side trader put it, algo wheels helped solve two issues: overload and complexity, and TCA. Several years ago we had a different dynamic at our desk, he recalled. “We had 100 algos to choose from, and we now had 50 new venues,” he recalled. Algo wheels made traders’ lives simpler. The other big benefit was TCA. After “Flash Boys” and the explosion of information about these formulas, the buy side became smarter. “This algo is providing better execution and algo wheels allows us to have a better data set. We have embraced it and it provides a lot of value,” he added. In closing the Summit, Merrin asked the eternal question: What is the role of the trader? One constant is the performance of his or her funds. “We have invested in AI and machine learning and this is the biggest opportunity for the industry,” said Merrin, adding that machine learning is going to get smarter and will handle more of those routine trading activities that add no value to trade performance. Members of Liquidnet’s EQS and Algorithmic Services teams are available to help your desk leverage its algo usage strategy. Please contact your Liquidnet coverage team to learn more.